Stasbourg, 17.06.2016 – Ahead of the Action Day against Hate Speech Targeting Refugees marked on the 20th of June, the Council of Europe called for a speedy and systematic reaction by public figures to the instances of hate speech against refugees and asylum seekers, and stressed the positive role the youth can play in integrating refugees in European societies. 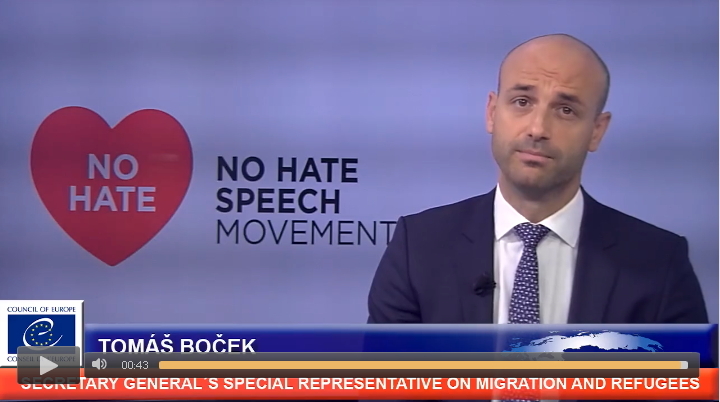 “Every person has a right to seek protection from persecution and war,” said Tomáš Boček, Special Representative of the Council of Europe Secretary General on migration and refugees. 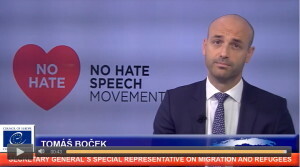 “I would like to encourage public figures – politicians, religious and community leaders – to swiftly and decisively condemn hate speech and also to reinforce in their discourse those values that unite Europeans during the most difficult times: respect for human rights for all”. “The 20th of June, World Refugee Day, is an opportunity for all of us to show support for people who come to Europe fleeing tragedy in their home countries, in search of peace and safety for themselves and their children,” he added. More than a million people crossed into Europe in 2015 fleeing war, persecution and poverty at home. This unprecedented wave of migration has led to the increase of hostile attitudes towards refugees, and of islamophobic and xenophobic hate speech at all levels. “Never leave humanity behind!” is the underlying message of the projects for young refugees that the Council of Europe has been supporting. Today, the Council of Europe through its European Youth Foundation has announced the awarding of new grants to 23 youth NGOs to run projects in 2017, totaling roughly €550,000. Several of these projects focus on the integration of young refugees. The Nordic Youth Association (Denmark) will train youngsters in Finland in February on inclusion and intercultural dialogue with emphasis on causes and impact of refugee crisis. A German-based network of youth organisations, European Youth for Action, will run creative theatrical projects on the war and migration in Berlin in March. Public discussions on hate speech “Networking against Racism: How to protect our values in a changing Europe” will be conducted in Germany, Czech Republic and elsewhere in Europe in support of migrants and refugees by the youth organisation UNITED (the Netherlands). On the 20th of June 2016, the Council of Europe No Hate Speech Movement and its partners will run a series of online and offline initiatives: in Strasbourg, an event in the « Lieu d’Europe » will be organised to present anti-hate speech messages, pictures and videos. In Germany, a new initiative Develop Alternative Perspectives and a project involving journalists in exile who write articles for the Action Day describing their experiences will take place. In Belgium, the No Hate Speech supporters will run a video campaign on challenges faced by migrants, and involve young refugees into the work of Flemish youth organisations and initiatives. Great stuff, thanks for sharing. What is the different between Legal immigration, illegal immigration and unvetted infiltrated with terrorists free loading refugees. I am glad that people try to protect refugees because I would like to be helped if I had problems and was forced to run from my own country. I like the expression of his face. It was really nice and interesting video. I would like to thank you for posting it here. Well, that is a good idea. I like initiatives like this one. I think that they should be good for the whole society. It is a very urgent and topical subject in society. I believe that everyone should make the right choice himself.